Skyline® Systems receive SRCC ratings of OG-100 or OG-300, qualifying you for Federal, State and Utility discounts. A taxpayer may claim a credit of 30% for a solar water heating system that serves a dwelling unit located in the United States and used as a residence by the taxpayer. Expenditures with respect to the equipment are treated as made when the installation is completed. If the installation is on a new home, the “placed in service” date is the date of occupancy by the homeowner. Expenditures include labor costs for onsite preparation, assembly or original system installation, and for piping or wiring to interconnect a system to the home. If the federal tax credit exceeds tax liability, the excess amount may be carried forward to the succeeding taxable year. The excess credit can be carried forward until 2016, but it is unclear whether the unused tax credit can be carried forward after then. The maximum allowable credit, equipment requirements and other details vary by technology, as outlined below. There is no maximum credit for solar water and space heating systems. Systems must be placed in service before December 31, 2016. Equipment must be certified for performance by the Solar Rating Certification Corporation (SRCC) or a comparable entity endorsed by the government of the state in which the property is installed. At least half the energy used to heat the dwelling’s water must be from solar in order for the solar water-heating property expenditures to be eligible. 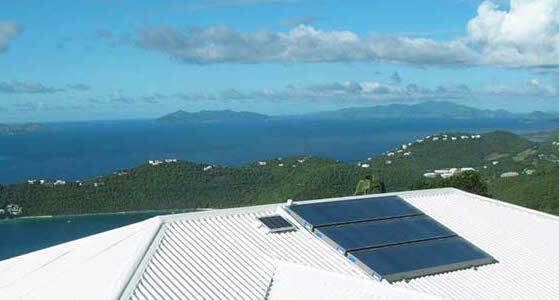 The tax credit does not apply to solar water-heating property for swimming pools or hot tubs. The home served by the system does not have to be the taxpayer’s principal residence. With a 30% Federal Tax Credit, many state incentives, huge increases in energy costs, 4 to 5 times the power density of Solar Electric PV and the great need to stop pollution and global warming, there has never been a better time to buy a solar water heater. IT TRULY PAYS TO GO SOLAR: Typical returns are 12 to 30% and on a refinance or new home you usually receive an instantaneous positive cash flow! Over 50% of families prefer solar! California’s Association of Realtors found that over 50% of families would be willing to pay more for a home with solar energy on it and that 60% would be more interested in buying a home with solar on it than one without. The research was done for the CA CEC in March 2002. California’s energy consumption could be reduced by over 2% by supplementing enough gas, propane and electric water heaters with solar water heaters. This move would do enormous good for California’s economy, significantly reduce pollution and free up large amounts of natural gas during peak times to produce electricity. This principle could apply to most other states as well.